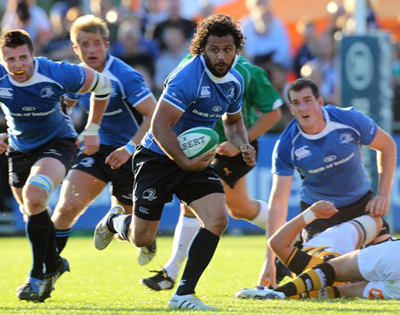 Isa Nacewa has been selected to play his 100th game for Leinster tomorrow in the Pro12 semi-final against Glasgow. Wrong. If Isa Nacewa had never been capped by Fiji back in 2003, the All Blacks would have given him a couple of caps at least – just like they gave Ben Atiga a cap in 2003, or Regan King a cap in 2004, or Sam Tuitupou ten caps from 2004-06, or Casey Laulala two caps in the same period, or Anesi Sosene a cap against Fiji in 2005, or Scott Hamilton two caps in 2006, or Anthony Tuitavake six caps in 2008, or Rudi Wolf four caps in the same year, or … you get the picture. The Blacks can be ruthless [or cynical, if you like] about how they give out caps. There’s no shortage of players in the All Blacks list who have only a couple of caps to their name [seriously, check out the link]. Nacewa came to Ireland in August 2008, having just turned 26. When you see lads like Laulala, Tuitupou, Sosene, Hamilton and Tuitavake who have all been capped by the All Blacks between 2003 [when Nacewa debuted for Auckland] and 2008 [when he left for Ireland], do you really think that he wouldn’t have got a look-in? Of course he would have. He probably wouldn’t have been locked into a jersey, but it’s very likely that he would have been capped. And then we’d be talking about “former All Black Isa Nacewa”and not day-dreaming away the fact that Fiji capped him when he was 21. Leinster didn’t ‘discover’ Nacewa, or turn him into a good player. He was always a good player. That’s why they signed him in the first place. This entry was posted in Opinion and tagged All Blacks, I hope not Bill ... that's the maternity ward, Isa Nacewa, Leinster, Rabo Pro12, Random Lomu quotes, Ruthless manipulation of people's emotions, That's the Kiwi way by dementedmole. Bookmark the permalink.